Metro Transit bus routes and both Green and Blue line lightrail stations are accessible from campus. Outdoor bike racks, indoor bike storage in the dorms, and new commuter locker rooms in the Hagfor’s Center make bike commuting easier. 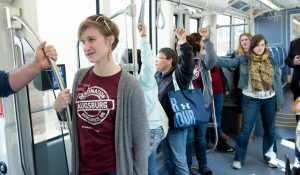 Every member of the Augsburg community is encouraged to be mindful of the ways they commute to and from campus and how it affects the environment. Our urban location has a plethora of transit options that make commuting to Augsburg easy, affordable and environmentally-friendly. Please see the Augsburg University Transportation Website for all of the options available to you.